OH. MY. GOODNESS. Or as the kids say today Ermahgerd!! (Did I really just say ‘as the kids say’?!?! I must be getting old.) 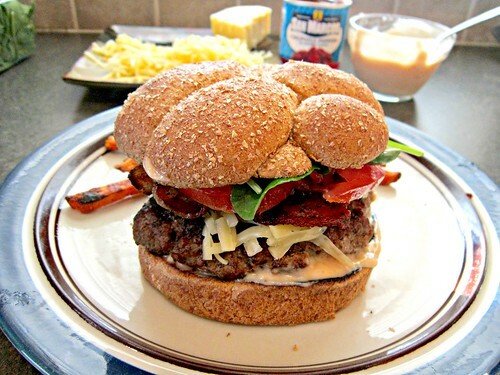 Anywho…these burgers, you guys, are freaking amazing. I absolutely love, love, love smoked Gouda. It is, by far, my very favorite cheese. And you know how I love chipotle – or all things spicy, really – so it just seemed like a natural flavor combination for a burger. Creamy, smokey Gouda, with smokey, spicy chipotle sauce. And bacon, of course, for a little bit more smokey flavor. Oh, and one of the best parts?!!? That pretty little ‘mater you see there…that’s from our garden!! I don’t know if you have Red Robin restaurants in your area, or if you’ve ever eaten at one, but it’s one of J and my’s favorite burger places. Like, we freaking love their burgers. I would say that this one is right up there with Red Robin quality and flavor. Freaking. Amazing. I might even make these again tonight. You should make them too. And you know, you can always grill the burgers for even more smokiness!! We had ours with some spicy sweet tater fries and it was the perfect, filling dinner. Mmm mmm good!! Getcha some!! In a large bowl, combine the sirloin, salt and pepper, garlic powder and Worcestershire sauce. Mix well and set aside while you cook the bacon. Cook the bacon in a large skillet over medium heat until browned and crisp. Remove to a paper towel-lined plate to drain the grease. Strain the grease from the pan and return to medium heat. Form the sirloin into 4 patties, place in the pan and cook 3-5 minutes per side, to your desired doneness. Meanwhile, in a small bowl, combine the mayo, chipotle sauce, and lime juice. Stir until well-combined and creamy. 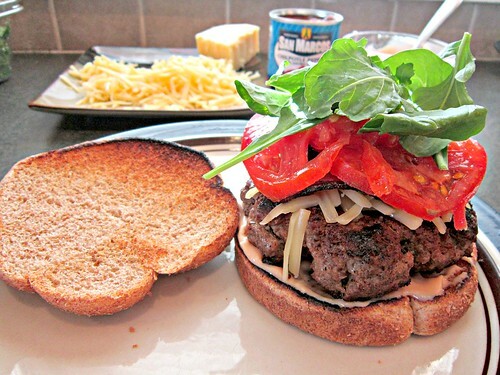 To assemble to burgers, toast the hamburger buns, then top with a tablespoon of the chipotle cream sauce, a burger patty, 1/4 cup of shredded Gouda (you can also add this in the last minute of cooking your burgers if you want it nice and melty-melty), 2 slices of bacon, a couple of tomato slices, 1/4 cup of arugula, and the top burger bun. There's nothing not to love about a grilled burger with smoky cheese, bacon and a (chipotle) cream. Then you went and added home grown tomatoes.